Congratulations to Peggy who won a pair of mini Judy Hopps and Nick Wilde Tsum Tsum. Thanks to everyone who took the time to enter and be sure to follow me on Twitter and Facebook to hear about more free giveaways throughout 2017! Interested in getting your own Disney plush Tsum Tsum? Please click this link to purchase some today! Have you heard about the latest Disney craze – Tsum Tsum? Tsum Tsum, which literally means “stack stack” in Japanese, are offered in both an app and adorable plush. The free app is available for download in the App Store or Google Play. Collect, connect, and pop the cute Disney Tsum Tsum to earn coins. The adorable Disney plush Tsum Tsum are the hottest new collector’s item and are available in a variety of characters and sizes. Disney character Tsum Tsum are available for purchase on DisneyStore.com, at your local Disney Store, at Target, and at Once Upon A Toy in Disney Springs. They come in three sizes – mini, medium, and large. They also have Tsum Tsum clothing and gear available on DisneyStore.com. 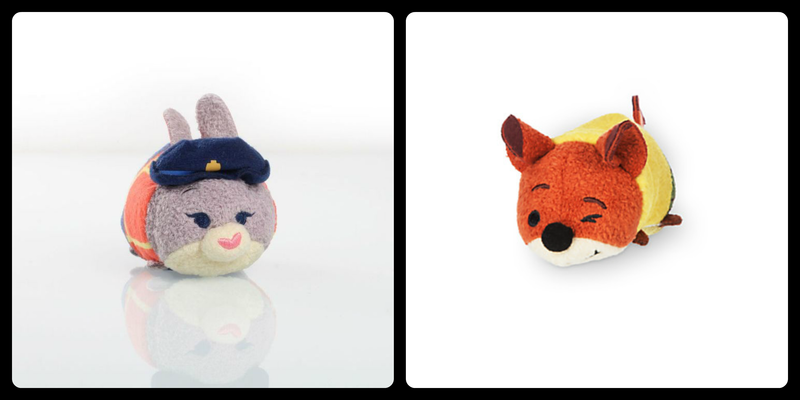 Mini Tsum Tsum are $5.95, medium Tsum Tsum are $12.95, and large Tsum Tsum are $24.95. There are many characters to choose from in a variety of sizes including Mickey, Minnie, Donald, Pluto, Goofy, Chip, Dale, Dumbo, Stitch, Pooh Bear, Tigger, Piglet, Eeyore, and more. On the first Tuesday of every month, a brand new collection of mini Tsum Tsum plush are revealed on DisneyStore.com.